Veni redemptor gentium is assigned to the Roman Catholic Office of Readings in the Liturgy of the Hours for Advent from December 17 through December 24. It was translated into the German chorale “Nun komm der Heiden Heliand” by Martin Luther with the melodic adaptation to the German words made by either Martin Luther or Johannes Walter. More recently, Dom Paul Benoit, OSB adapted the chant into the hymn tune Christian Love, as a setting of Omer Westendorf’s text “Where Charity and Love Prevail,” a common meter translation of the Holy Thursday chant hymn Ubi caritas. Posted in Themes. Tagged Advent, chant, Dom Paul Benoit, Johannes Walter, Martin Luther, Nun komm der Heiden Heiland, Ubi caritas, Veni redemptor gentium. The German chorale “Nun komm, der Heiden Heiland” is a translation of the Latin chant Veni redemptor gentium made by Martin Luther. The melody for the chorale was adapted from the same chant by either Martin Luther or Johann Walter. While the chant hymn is designated as part of the Roman Catholic Office of Readings for December 17 to 24, the Lutheran hymn has become closely associated to the First Sunday of Advent. Posted in Themes. Tagged Advent, chorale, German, hymn, Johannes Walter, Martin Luther, Nun komm der Heiden Heiland. 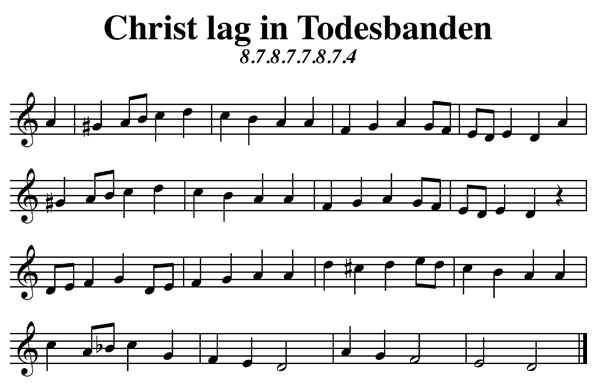 The chorale Christ lag in Todesbanden is an adaptation of the chant Victimae Paschali laudes. The arrangement is credited to Johann Walther who published it his Geystliche Gesangk Buchleyn in 1524, but it is possible that Martin Luther may have assisted in the adaptation. 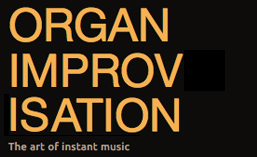 See a list of other chorale and hymn tune themes here. Posted in Themes. Tagged chorale, Christ lag in Todesbanden, German, Johann Walther, Martin Luther, Victimae paschali laudes. 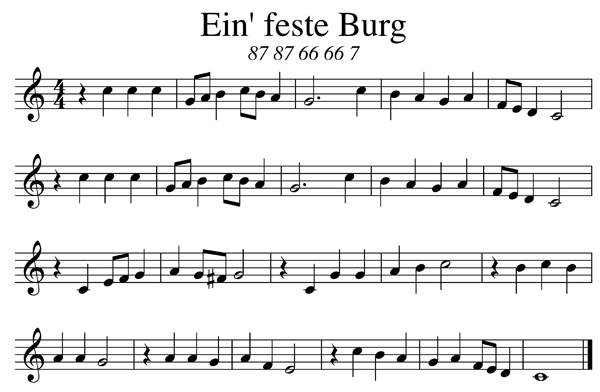 Ein feste Burg is one of the best known of Martin Luther’s hymns. The words, a paraphrase of Psalm 46, and melody were written sometime between 1527 and 1529. It is strongly associated with the Reformation. The original melody was much more rhythmic, but it has been standardized into the isometric rhythm shown above. See a list of other chorale and hymn themes here. Posted in Themes. Tagged chorale, Ein Feste Burg, German, Martin Luther, Psalm.